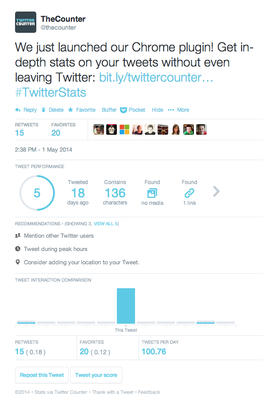 Get stats and custom recommendations for every tweet in the Twitterverse, without even leaving Twitter. The Twitter Counter browser plugin can be a useful tool to all Twitter users. On the one hand, Twitter newbies can benefit from the personalized recommendations on how to improve their tweeting. On the other hand, marketers get insights and recommendations not only on how their own content is performing but also on the tweets of competitors, industry leaders and influencers in their field. And all this delivered in a concise way, straight from the user's Twitter feed. After the plugin is installed, an “Analyze” option will appear below each tweet in the user's Twitter feed. 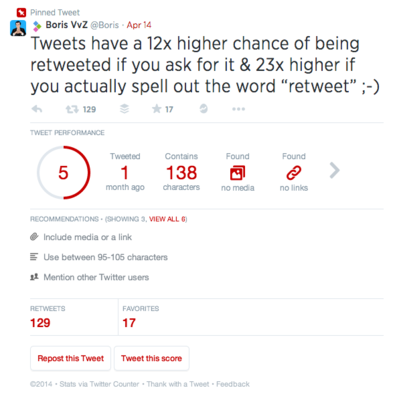 Once clicked, the tweet unfolds revealing statistics and recommendations. First, there is a breakdown of the tweet's performance based on a number of factors such as the number of hashtags, links and images, followed by custom recommendations to help the users improve their tweeting. At the last section, there is a graph of interaction which compares the engagement rate (retweets and favorites) of this particular tweet to the last 5 as well as the next 5 tweets of the user. There is also an overview of the average number of tweets the user is posting, and the average number of retweets and favorites the user gets per tweet. Similar to the user’s own tweets, there is a breakdown of the tweet's performance followed by custom recommendations to help that improve his or hers tweeting habits. User’s can also interact by retweeting this specific tweet or by tweeting the tweet’s to the user they’re checking.